Ellen O’Farrell is a professional hypnotherapist who works out of the eccentric beachfront home she inherited from her grandparents. It’s a nice life, except for her tumultuous relationship history. She’s stoic about it, but at this point, Ellen wouldn’t mind a lasting one. When she meets Patrick, she’s optimistic. He’s attractive, single, employed, and best of all, he seems to like her back. Then comes that dreaded moment: He thinks they should have a talk. Braced for the worst, Ellen is pleasantly surprised. It turns out that Patrick’s ex-girlfriend is stalking him. Ellen thinks, Actually, that’s kind of interesting. She’s dating someone worth stalking. She’s intrigued by the woman’s motives. In fact, she’d even love to meet her. After all, when you think of a stalker the image that normally comes to mind is a creepy (probably hairy) man lurking in basement. How could a seemingly normal, successful career woman behave in this extraordinary way? I wrote down the words “Ordinary Stalker” as a possible idea for a novel. I wanted to create a believable, flawed character who is stalking a previous partner. Another subject that had always intrigued me is hypnotism. I decided the novel’s other main character would be a hypnotherapist. It was a wonderful excuse to go off and get myself hypnotised all in the name of research. 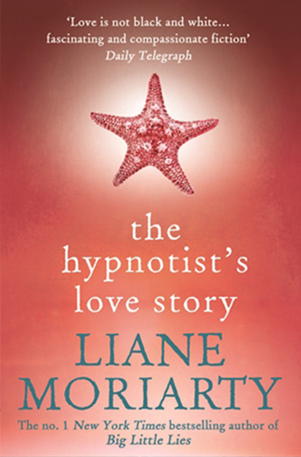 The result is The Hypnotist’s Love Story. It’s about Ellen, a hypnotherapist, who begins a relationship with a single father who is being stalked by his ex-girlfriend Saskia. After I wrote the first three chapters, I thought, Mmm, I think I’m accidentally writing a thriller. But although it does have elements of suspense, The Hypnotist’s Love Story is really a contemporary story about the murky areas between right and wrong, and the lines we’ll cross for love. Liane Moriarty is the author of seven international best-selling novels, Three Wishes, The Last Anniversary, What Alice Forgot, The Hypnotist’s Love Story and the number one bestsellers, The Husband’s Secret, Big Little Lies, Truly Madly Guilty and the upcoming new novel Nine Perfect Strangers.